What’s in your RV tool bag? Do you have everything you might need to fix the things you know how to? Do you have the knowledge to fix the little stuff? RV systems are different than the ones in your home. There is no way to know what is going to break next on our rolling homes, but we can be sure of one thing, something will! But the good news is 80% of our RV problems can be fixed with a little knowledge and carrying the right tools with us as we travel. 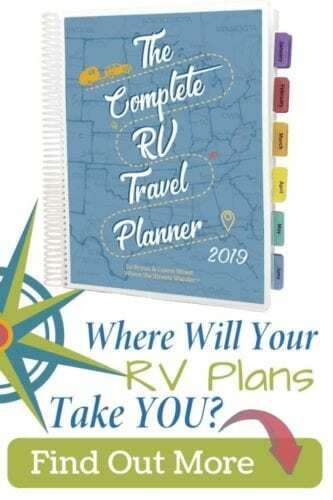 Here is a great list to start filling your RV tool bag. The first thing in your RV tool bag should be knowledge of RV systems. RV systems are unique and different from our home systems. When starting out RVing, there is a lot to learn and if you aren’t familiar with how 12 volt electrical systems, propane, and RV refrigerators work you can quickly be overcome with purple monkeys. Purple monkeys are things that go wrong in RV’s seemingly for no good reason. You drive down the road, and now your propane won’t come on, or your batteries aren’t charging. Learning about these systems and arm yourself with knowledge. This can save you a lot of money. You will never have to call an RV Maintenance Tech to come and find out you should’ve reset your GFI switch. There goes $50-$75 out the window! That’s a costly lesson! 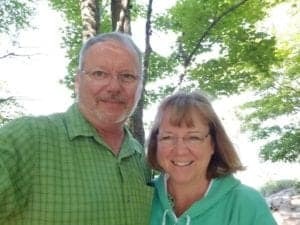 Bryan and I recommend educating yourself with the resources available at RV Tech Course in a Box . Bryan did the live option and thought it was well worth the money! Through this course, you can learn all about your RV systems and learn tips that can save you from paying an RV Maintenance Tech to fix easy to solve problems. If you can’t attend live, the home study option is a great way to get the information and equip yourself with the knowledge that will save you tons of time & money & inconvenience in the future! The following items are recommended by Bryan and are the ones he has in his RV toolbag. Combination Wrenches are a must for your RV. Many RV may use both Metric and SAE. You may have to use these in your engine, generator, water heater, or anywhere you might need to tighten or replace something. Note: the kit above already has a set included. I added extra adjustable wenches. The kit has one 8 “ adjustable wrench but I like carrying a 6” and 10”. Those sizes seem to be most helpful when using them in RVs. Locking, regular and needle nose pliers are things I can’t live without. You will use these in a variety of places in your RV. You can never have too many! If you are like me, you will need plenty of screwdrivers to choose from. Having a Phillips' head, flat head and square head screwdrivers on hand will make your life easier. My RV uses a lot of square head screws. Be sure to add this type to your to your drill bit set. A 12-volt tester is one one the handiest tools in my bag. This is the fastest way to check for 12-volt dc power. You will use this often since the RV uses 12-volt power. Just put the clip to ground and use the probe to find power. Having an RV, you will need the ability to check AC and DC voltages. If you have never had a chance to use a Multimeter, they are easy to use, It will come with a manual on how to use it or better yet check out YouTube. These wire stripper/crimpers are something every RV owner should have one or maybe two of. Be sure to get a terminal connector kit and extra wire in different sizes. This will come in handy when you need to fix an electrical issue. This receptacle tester will tell you if your power receptacle is wired correctly. You will want to test your GFI circuits. Use this to trip your GFI circuit in your kitchen area and bathroom area to make sure you can reset them. A service call just to reset a breaker can be expensive. I recommend buying a set of heavy-duty jumper cables with at least 2 AWG wire size. A 1 – AWG wire size would even be better. Sets with 4 AWG and 6AWG may work in some applications but they're not able to handle larger amp loads needed to start big RV motors. Big motors need a lot more cranking amps. You are far better off to nice big heavy duty set to begin with. Another great battery tool is a battery load tester. These are fairly inexpensive and can help determine the working condition of your RV batteries before you hit the road. Check out YouTube for how easy it is to use. 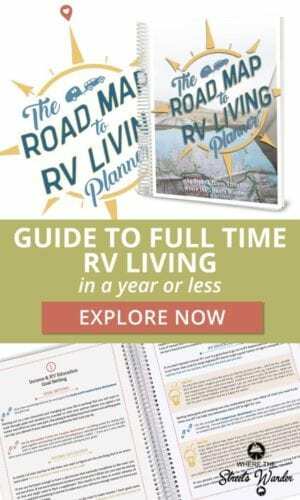 Equipping yourself to know about your RV systems and having the correct tools to diagnose problems and then solve them is a huge part of being a confident RVer. Take time to educate yourself and make sure you have what you need in your RV Tool Bag to keep the purple monkeys at bay. Stock your RV Tool Bag today! Need to outfit your RV Kitchen or Bedroom? You will love these 10 Must-Have Items for each room! Thanks for this useful post about good tools to take along when in your RV.